A long, long time ago, in 1992, back when “warez” was spelled “wares” and the fastest DIAL-UP MODEM connection was a US Robotics proprietary standard HST 14.4 – that’s 14.4 kbit/s – I was part of the ANSI art underground. Someone else has been fortune enough to try to catalog as many art packs as they can from those days of dial up, and you can find them all on Sixteen Colors. Seriously, it’s this type of archive that the internet was created for. I’m going to have to dig around my own 3.5″ floppies and a 1GB Iomega Jaz drive I’ve got sitting around to see if I can find anymore art packs. Maybe I’ll even find something that Sixteen Colors doesn’t have archived anymore. 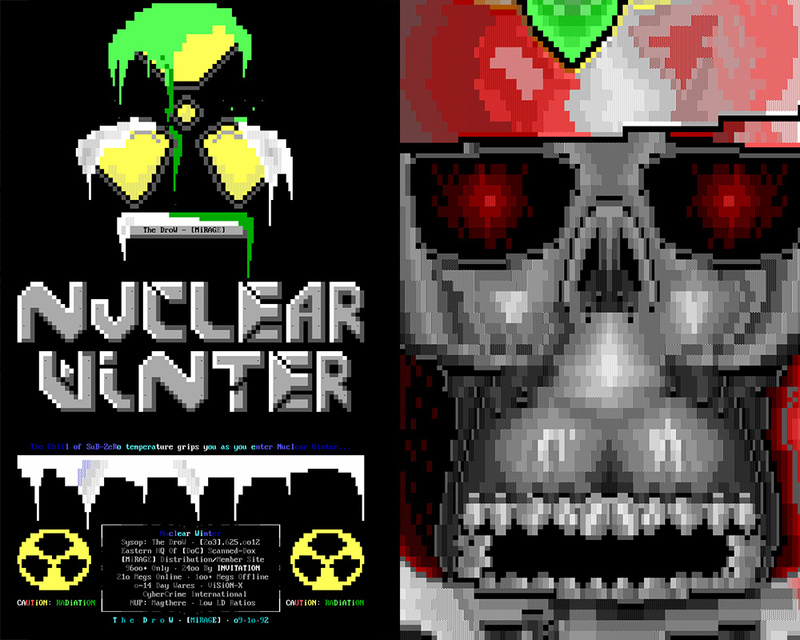 I know for sure I’ve got a 320 x 240 pixel (I think) image advertisement for my BBS, Nuclear Winter, somewhere that I rendered pixel by pixel in DeluxePaint. Yeah.